How to make too small shoes FIT in under 30 minutes! Ever go to the store and find a HOT pair of shoes on sale that are just half a size too small? We all do this…the price is too good to pass up! So we buy them, suffer through wearing them for one night and then promptly shelve them in our closet to gather dust. We want to wear them but every time we look in their direction, our feet scream, “PLEASE NO, we will walk over burning hot coals before we want those on us again!” Not to worry, you can keep buying these great sale shoes and save your feet with the simplest trick! Put on a thick pair of furry socks. (You know the horribly ugly ones that you wear under your boots because they keep your tootsies nice and toasty?) 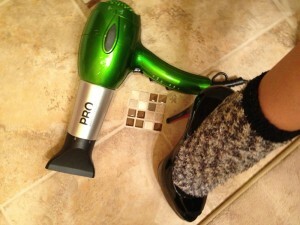 Take your blow dryer, turn it all the way up and blow dry the inside of your too tight shoes. Do not let the blow dryer sit directly on the leather, keep it an inch or two away. Blow dry one shoe on the inside for a minute or two and then place your furry socked foot into it and then blow dry the outside (I like to keep it at least 3 inches away on the outside). Repeat with the other foot. Then walk around your house for 10-30 minutes depending on how tight the shoes are. Pop ‘em off, take off your socks and slip your foot into your new, correctly sized shoe. Your feet will thank me!